Developed by industry heavyweight MicroGaming, Hot Air is one of the most popular online slot games. Based on a fun and lighthearted theme, this is a low risk game that foregoes the popular progressive jackpot. Is the gameplay enough to hold the game up without the popular progressive features? Let’s take a look and find out. The visual aspect of any slot game is critical. Because games are based online they need to have enough glitz to make the experience both immersive and realistic. 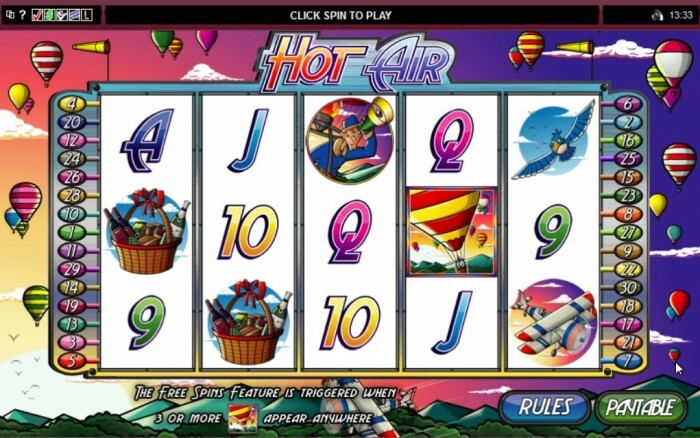 Hot Air is a slot game that offers basic graphics that are more functional than dazzling. Depending on tastes the graphics might not suit all gamers. Many will find the graphics to be underwhelming and simplistic, but for those focused on the pure thrill of slots this might not be such a problem. The theme itself is based on Hot Air balloons and flight, so icons like the bird, the hot air balloon, the picnic basket, and the airplane feel especially appropriate. The slot animations are fluid, and the symbols are cartoony and playful. There’s a lot of color used to make the game eye catching, but no one would mistake the look to be state of the art. There are 30 playlines to choose from in Hot Air, and players have the option to place up to 10 coins on a line. The coins available are 0.01, 0.02, and 0.05, so there are options to make custom bets using these increments up to a total value of 15. There’s a free spin feature built in to the game, and if lines show a minimum of three scatter symbols on screen players will unlock the feature. The scatter symbol is represented by a hot air balloon. Any time that this occurs, 10 free spins are made available, and any resulting payouts are doubled. In addition to this, pilot and balloon symbols appearing during the free spins are accumulated, and carry over to the following spins. Each pilot is worth an additional free spin. Each balloon increases the multiplier on the pilot spins by x1. Hot Air incorporates another popular feature where payouts can be multiplied. Winners can stake all or part of their winnings on a red or black guessing game to double their payout. For those feeling especially lucky, there’s also an option to choose the suit of a random card, giving a 1 in 4 chance to quadruple the payout. Unfortunately there are no progressive jackpot features in Hot Air. The fixed jackpots in this game are also relatively low. The fixed jackpot is set at 2000 coins. The flip side to this is that Hot Air has more chances to pay out than the average slot machine. Some payouts occur when only two symbols are lined up, so Hot Air is more about making smaller and more regular winnings. Players looking for more thrills over a short time will appreciate this design choice. Offering 30 playlines with 10 coins per line is a definite advantage. This provides for more chances to win, and highly customizable bets for players. With the low jackpot, frequent payouts, and maximum total bet of 15, this is a game suited to beginners and those who aren’t interested in risking too much on a game of slots. The graphics feel dated, and in 2015 they’re definitely out of place. The game offers little eye candy to players who are interested in an ultra-realistic experience. Hot Air is a basic slot game that offers fun gameplay, with payouts that are more frequent than the average game. Regardless of the payouts being relatively small, there’s still a lot of fun for new online bettors and even veterans who are looking for some low risk gaming. Players looking for state of the art graphics won’t find them here, but there’s still enough on offer that makes this game a good choice for casual online gambling.